Does Whoscall provide information regarding private numbers? Whether the number is blocked or not, a private number is impossible to trace or reveal through any app or device since it is private. The only exception is when requested by law enforcement institutes or any other unit with the authority. What should I do if I failed to receive the verification code (SMS) while verifying my phone number? If you could not receive the verification code, please tap “Voice Call Verification”. Voice Call Verification is available all over the world. To use Voice Call Verification, please take the following steps: 1. Tap “Voice Call Verification”. 2. Hear the busy tone. 3. Hang up. Can I restore my account and information when re-installing Whoscall? Whoscall identifies users by their registered account(Google account) only. 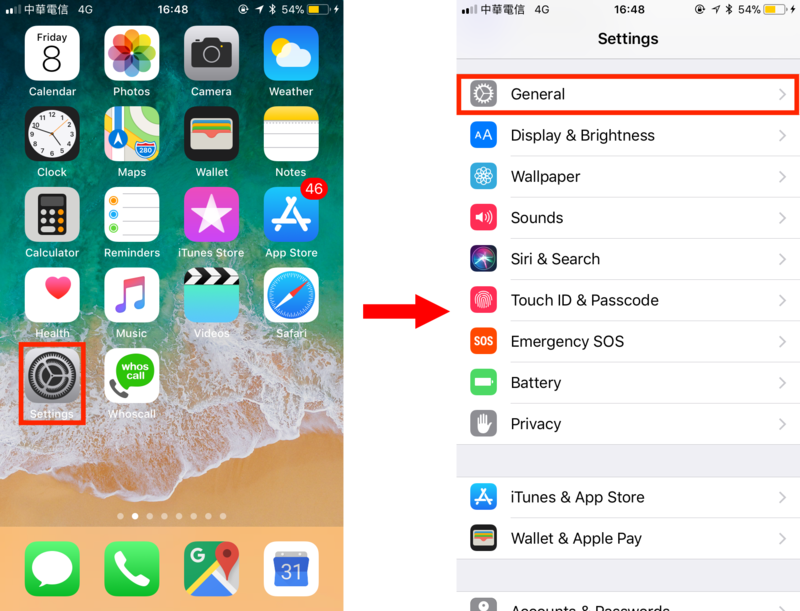 Whether you lose your phone, change your device, wish to activate the app on multiple devices, or re-install the app, you can retrieve information (blocklist, tag memo and favorite number) as long as you login with the same account. What should I do if I failed to block phone calls? Block failure happens for multiple reasons. 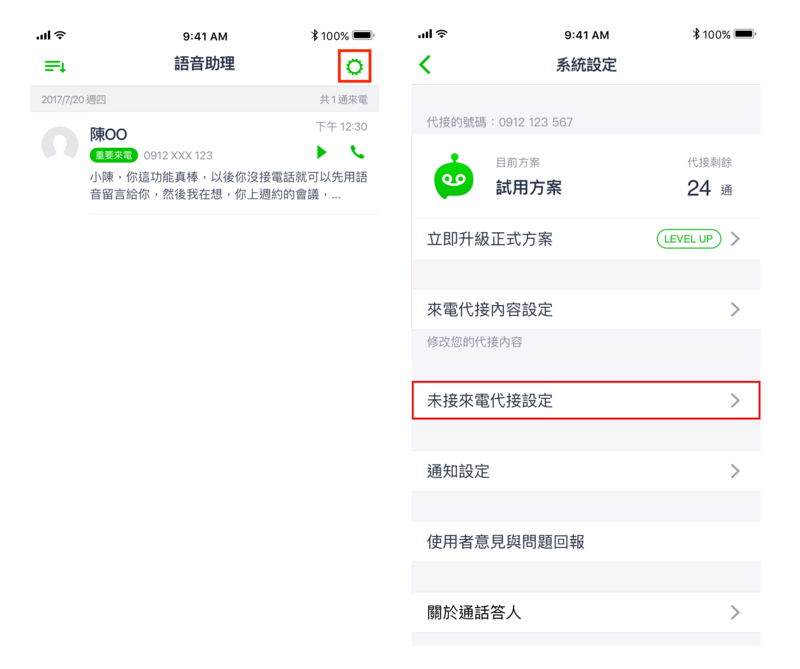 In order to specify the problem, please check the following questions and notify us through the in-app customer service form. Our staff will be happy to assist you to solve the problem. Though failed, did you still receive the block notification on the upper-left corner? Though failed, did the number still appear in the blocked history (check the leftmost tab)? Though failed, did the number still appear in the My Blocklist? What should I do if I failed to block text messages? Is your OS system android 4.4 and above? Starting from Android 4.4, Google has revoked SMS/MMS permissions from developers. Due to that fact, Whoscall will not be able to block SMS/MMS for Android versions 4.4 and above. Call blocking feature is not affected. How do I delete a tag or memo? Tap the number to which the tag you want to delete belongs to. Tap “Delete” on the report screen. Tap the number to which the memo you want to delete belongs. How do I edit my ShowCard? To activate the ShowCard, you need to verify your phone number. After verification you can edit your information on the ShowCard and your modification will be applied within 24 hours. How do I add a category to favorite numbers? Tap “favorite numbers” (the rightmost tab). Tap the folder on top to add a new category. Lightning identification provide the database that included popular numbers and spam numbers. When you download to activate it, the numbers in database call in, the caller ID will show up immediately. What is Yellow Page Database? Starting from Whoscall version 4.2, yellow page database will be merged with lightning identification database. ShowCard containing the forbidden words will cause failed. Whoscall will check the name you edited, if the name contains the forbidden words, it will cause your edit unsuccessfully. What is a “During-call pop-up dialog” and what is an “After-call pop-up dialog”? During call pop-up dialog: When there is an incoming call, Whoscall automatically provides instant caller information in this dialog. After call pop-up dialog: When a call is over, Whoscall provides an “after call pop-up dialog” offering options such as block, call back, etc. If you could not answer the call, a missed call notification will appear in the dialog. SMS dialog: When there is a message, Whoscall automatically provides instant caller information in this dialog. Why does not Whoscall provide a pop-up dialog? Please go to “Settings” and check whether the “During Call pop-up dialog”/ “After call pop-up dialog”/ “SMS pop-up dialog” is activated. Enter “Settings” and scroll down to “During Call pop-up dialog”/ “After call pop-up dialog”/ “SMS pop-up dialog. Check if the options are checked properly. Check if “Show dialog when no information” is not checked, the During Call pop-up dialog will not show up when the no information. Check if “Pop-up dialog when roaming” is enable wifi only, the pop-up dialog will only be activated on wifi when roaming. If you still do not see any information for incoming calls, please report us your problem via the in-app customer service form. How to adjust the position of during Call pop-up dialog? During call pop-up dialog can be moved by dragging. What can I do when the information on the “During call pop-up dialog” is different from the actual information? Our search mechanism will regularly search the internet and update information. It is possible that your information is the most recent and has not been updated to Whoscall. Please provide us with your phone number via the in-app customer service form. Our staff will be happy to assist you. I am using a Dual Sim Card Phone, can I use Whoscall? At the moment, Whoscall is having some difficulties operating on dual sim card phones and thus cannot normally show “Call pop-up dialog” when there are incoming calls. Our engineers are doing their best to solve this problem. We are really sorry for the inconvenience. In order to run Whoscall successfully, please follow the instruction to check your phone setting. In order to operate Whoscall successfully, please follow the instruction to check your phone setting. Why are there still messages in my voicemail box from numbers I blocked? Why cannot I receive calls from numbers that I have unblocked? 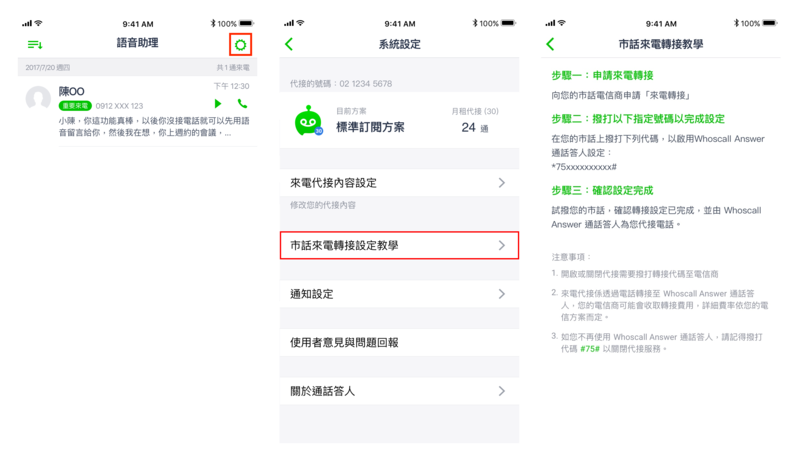 In order to specify the problem, please check the following questions and notify us through the in-app customer service form. Our staff will be happy to assist you to solve the problem. Did you delete the BLOCK RULES (blocklist) set previously? Please check your other apps might have similar block feature or features within your mobile device. 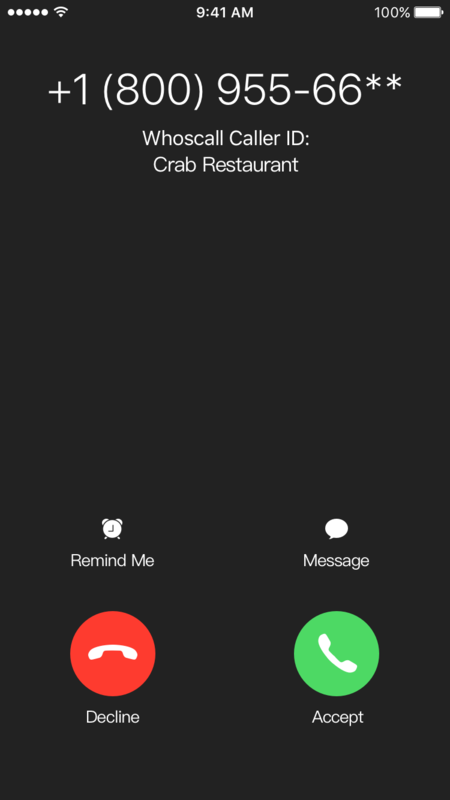 Why do I still receive “one-ring” calls from blocked numbers? Whoscall follows the Android Official API when blocking incoming calls. The “one-ring” situation may persist depending on devices, regardless of the block function provided by Whoscall. How can I block specific phone numbers (i.e. private numbers, phone numbers starting with or international phone numbers...)? Tap “Blocked History” on the leftmost tab. Tap “Go to My Blocklist” on the bottom. Tap ” + ” at the upper right to add a new blocklist. Can I transfer my old account and its information to a new one? We are sorry but an account and information cannot be transferred to or replaced by another one. How can I verify my new phone number using a previous account? Login with your existing account. Tap ” Profile” on top. Tap “Change number” and verify your phone number via SMS. Note: Versions earlier than 3.8.8.8 do not support this function. Please update Whoscall to its latest version before verifying your phone number. Why does my personal information appear on Whoscall? Whoscall searches any public information on the internet and collects reports by Whoscall users. If you want to remove your information from Whoscall search results, please send us your request via the in-app customer service form. Our staff will be happy to assist you. What information do I need to provide to use Whoscall Card? 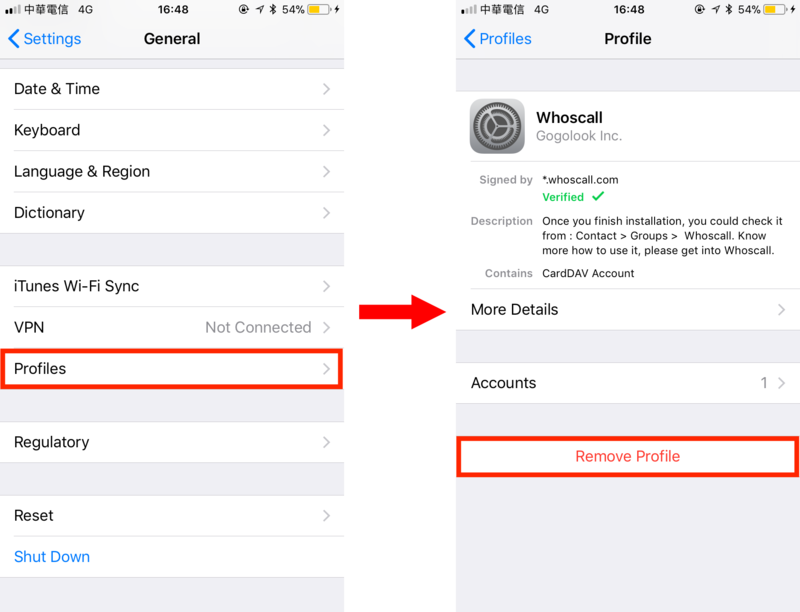 To use Whoscall Card, you must be a registered user, verify your phone number, and provide a display name. Why does it show that I am in violation of the Terms of Service when I attempt to turn on my Whoscall Card? This situation occurs when your phone number status is classified as high-risk. Whoscall classifies phone numbers based on information from governmental sources, behavioral analytics, and reports from our user community. Due to security concerns, we do not allow numbers classified as such to use our Whoscall Cardservice. For additional information, please contact our customer support e-mail. I have need for different identities, can I apply for more than one Whoscall Card? You can apply for up to 3 Whoscall Cards, but each one must be verified using a different phone number. Can I use Whoscall Cardwith a landline number? Why does it take up to 24 hours for information to be updated? To prevent abuse, we place a limitation on changing your information. This is also a reminder that you should keep information on your Whoscall Cardas accurate as possible. How do I delete my Whoscall Card? Switch to your Whoscall Cardtab and enter the “Card Settings” page, where you can delete cards tied to each phone number. Are my contents viewable to everyone once I apply and fill out my Whsocall Card? Why is there information still being displayed even though I switched off my Whoscall Card? Switching off your ShowCard will hide information and content provided by yourself, but will not hide information reported by the community or gathered from third-party sources. Why can others see information regarding my number even when I have not applied for Whoscall Card? These information might have been gathered from third-party sources such as the Internet, or provided by reports from the community. You can apply for a Whoscall Card to provide your own information if needed. What should I do if I find inaccurate/false information when viewing Whoscall Cards of others? Since Whoscall Cards are edited by card holders, we cannot verify the accuracy of each piece of information. Please take caution on any information you see, and use the report button found on each number detail page, or the flag function located at the top right of Whoscall Cards accordingly. Why is there warning text displayed alongside the cards? We provide warning text for numbers that have potential security concerns. This is a general warning and not directed towards any specific user or number. What can I do if I find offensive content on Cards? Please use the “flag” function located at the top right of Whoscall Cards. We will process each case accordingly. I am changing my phone, how do I transfer my Whoscall Card information? After installing the latest version of Whoscall on your new device, please login with your original account (Google account, FB) and re-verify your number. Your card information should be retrieved once you complete these steps. I am changing my phone number, how do I transfer my Whoscall Card information? Please login using your original account (Google account, FB), and go to the number management area in the “Card Settings” page. After finding your number, expand the menu to the right and click on “Change Numbers.” Upon completing verification, your card will be bound to this new number. I’ve changed both my phone and phone number, how do I delete my past Cards? Please login to Whoscall using your original account (Google account, FB), and go to the number management area in the “Card Settings” page. Expand the menu to the right of your number, and click on “Delete Number” to erase information of that card. What is "Premium plan" in Whoscall? To continously provide great service to users, we've add some ads into the app. However, in the meantime, we understand that some users need smooth using experience without ads. Therefore, we've launched Premium plan -- only $0.99 for a month and you can enjoy a totally ad-free Whoscall. If I re-install the app or factory reset my device, do I need to subscribe again? Premium Subscription is binded with Google Play account. Just login the same Google Play account you used to subscribe and your subscription can be restored. I've subscribed Premium plan, but I cannot find my subscription record in Whoscall. How to cancel the Premum subscription? 2. Go to "My account"
3. Find "Whoscall Premium Plan" in "Subscriptions" and click "Cancel"
Caller ID is only supported on iOS 10 and above. In order to give you the best experience, we will support only Number Lookup for devices on iOS 9 or older from October 1, 2018. To use the improved Caller ID services, please update to the latest version of iOS. What restriction does Whoscall have on iOS system? Whoscall identify calls by querying offline database that be downloaded in advance rather than online databse. Cannot show dialog on in-call screen. Cannot block “No Caller ID” numbers. How to activate "Caller Identification & Blocking"? Find "Call Identification & Blocking" option. Find "Whoscall" and turn on it. Remember to come back Whoscall to finish settings. After I activated "Caller Identification & Blocking" in Settings, it shows an error. Delete your Device's "Settings" from the multitasking drawer (double tap the "Home" button, and drag "Setting" upward)​, enter "Settings" and try again. If steps 1 failed to work, please try to restart your device and try again. If it keep failing, please try to reinstall Whoscall and try again. Why "Call Identification & Blocking" will automatically disable often? Because iOS system is unstable. We've reported this issue to Apple and waiting for solving. How to fix the Update Failed error when updating Caller ID database? Please contact us and share your error case by screenshot. I activated the "Caller Identification & Blocking" but some numbers are still unknown even though it has information when I did a reverse lookup? Caller ID database are picked by Whoscall, it includes spam and popular incoming numbers (Almost over tens of thousands numbers). Considering iOS performance, we cannot import all Whoscall numbers therefore some numbers will remain unknown. You can add numbers you looked up into your My List for identifying them next time. Why Whoscall cannnot block "No Caller ID" calls? Whoscall cannot block "No Caller ID" calls due to iOS system restriction. Why can I receive calls from numbers that I had blocked? If the numbers you added is spoof number, blocking might fail due to incorrect number format. How to activate Quick Search? Open your iOS Notification Center's "Today" page. Scroll to the end and select "Edit" Button. Add the Whoscall into list and tap "Done" button. How to use Quick Search? Long press the number you want to lookup and copy it. Open your iOS Notification Center's "Today" page and you will see the number information Whoscall provided. Please restart your iPhone and try Quick Search again. If it still unavailable, please contact us. Numbers in My List will be identified when it calls next time. My List numbers will not be saved in your personal contacts. How to delete Whoscall profile? Find "General" option in the Settings app. Find "Whoscall" in "Profiles" option and tap the "Delete Profile". 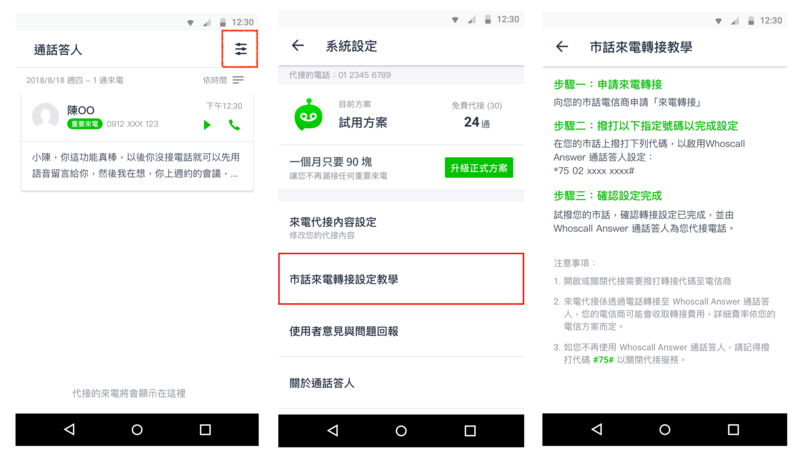 How to deal with the alert of「Input CardDAV Whoscall Password」? Please refer previous question to delete Whoscall profile. Tap the "+" button after number looking up in widget or number details page. Tap the "+" button on the top right in My List page. How to edit the numbers from My List? How do I delete my report? Navigate to the number details page of the number you reported before. Tap the report button on the top right. Tap the delete button on the top right (Garbage can icon). This button will only show for the numbers you have reported before. Why is my personal information on Whoscall? Whoscall search results include information provided by the user community, our databases, and public data on the Internet. If you would like to remove your number's information, please contact our customer service. Our customer service will guide you through the process. What is "Ad-free plan" in Whoscall? To continuously provide great service to users, we've added some ads to the app. However, we also understand that some users want an ad-free experience. Therefore, we've launched our Ad-free plan, where you can subscribe monthly or annually. Ｗhy is the subscription unavailable? Whoscall cannot receive the subscription item from Apple might due to the unstable network. Please check your network or retry it later. Subscription is bound to Apple ID account. You don't have to subscribe again even with other devices. Please refer below steps to restore your subscription. Make sure that you've logged in with Apple ID account you used to subscribed Whoscall Ad-free plan on your device. Open Whoscall then finds "Ad-free plan" section on the page of the last tab. Click the (i) icon in the top-right corner. Click "Restore Purchase" button on Subscription Details page. How to cancel my Ad-free subscription? How to check my Ad-free subscription? Will Ad-free subscription be synchronized on both Android and iOS if I only subscribed it on one of them? Subscription is bound to Apple ID account. We don't support the cross-platform subscription. How to change my Ad-free subscription plan? Can Whoscall provide real-time caller identification? Due to system OS limitations, we could not provide this feature to all devices. How to activate real-time caller identification? Turn on the caller ID switch button. System will show a permission request popup dialog, Please tap "Yes". You will get a successfully activated Whoscall notification. * If you never activated this function, your phone will be rebooted after step 4. Once rebooted you will get a successfully activated Whoscall notification. Please make sure that you have the latest network+ (Check update). Do not install Whoscall in SD card. Real-time caller-ID cannot be activated if installed in SD card. If you installed Whoscall in your SD card, Please go to “Storage Sense”and move Whoscall from SD card to your local storage. Real-time caller-ID is only available for specific OS version and device. Please refer to first FAQ question. Can Whoscall provide information regarding private numbers? What should I do if I fail to receive the verification code (SMS) while verifying my phone number? If you cannot receive the verification code, please tap "Voice Call Verification". Whoscall identifies users by their registered account (Google account) only. If you lose your phone, change your device, wish to activate the app on multiple devices or re-install the app, you can retrieve your information (blocklist, tag, note and favorite number) as long as you login with the same account. Can I block using Whoscall Windows Phone version? Block feature is not provided in Whoscall Windows Phone version but a warning list function is provided. You can add numbers into the warning list, when a number in the warning list calls, you will receive a warning notification through Whoscall contact book. Will the Call Guard in Whoscall affect my mobile phone experience? No, Whoscall Call Guard will not affect your daily mobile using experience. Call Guard database is put in temporary contact book of Whoscall. Call Guard database will be automatically removed upon Whoscall uninstallation. How do I delete a tag I created? Tap the number that is tagged. Tap "Delete" on the report screen. How do I edit my Whoscall card? To activate the Whoscall card, you need to verify your phone number. After verification you can edit your information on the Whoscall card and your modification will be applied within 24 hours. We construct Call Guard database based on community feedback, statistical analysis and calculations. The alert information will appear to users when they receive phone calls or SMS from numbers collected by the Call Guard database. 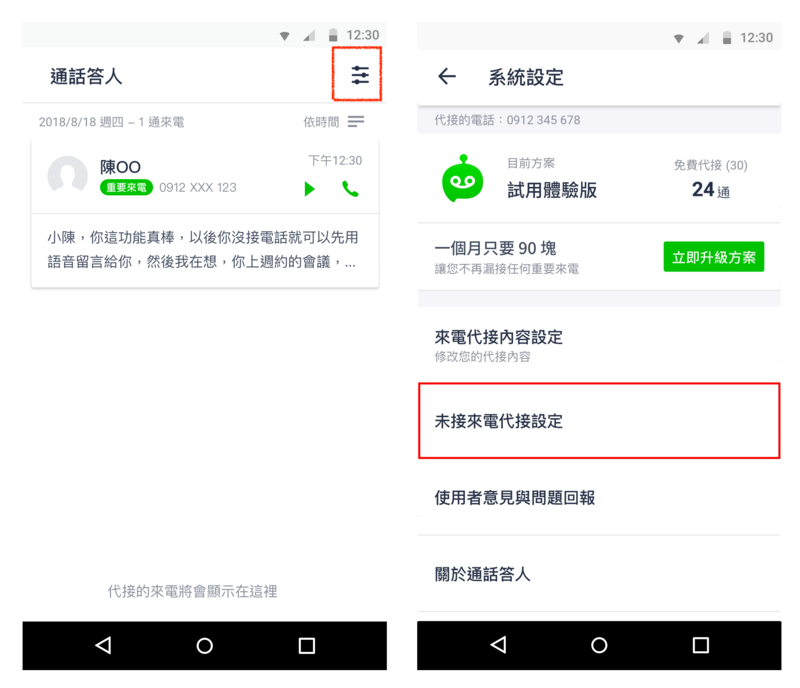 If you download the Call Guard database to your device, you will be able to identify these types of calls or SMS even if you do not have any Internet connection. Lightning identification is a database that includes popular numbers and spam numbers. When activated, caller-ID will show immediately when a number in the database calls. No, account and information cannot be transferred to or be replaced by another account. Tap "Change number" and verify your phone number via SMS. Whoscall searches public information on the Internet and collects reports from Whoscall users. If you want to remove your information from Whoscall search results, please send us your inquiry via the in-app customer service form. Our staff will be happy to assist you. © 2018 Gogolook Co., Ltd.